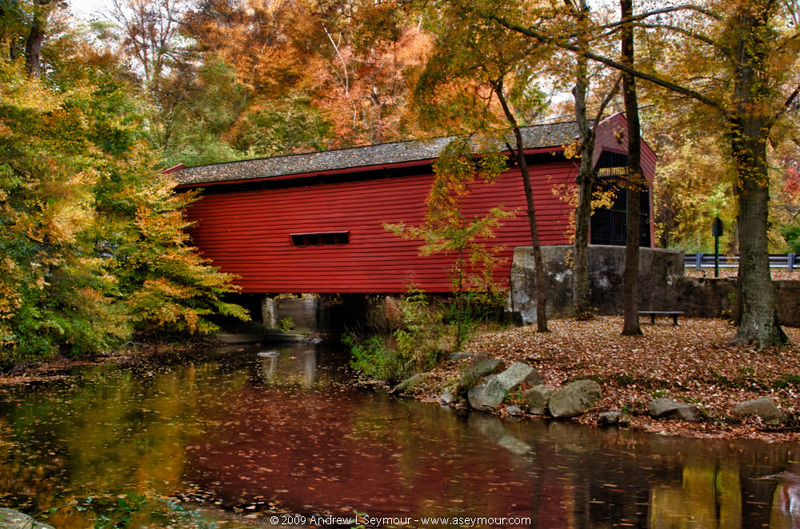 Just got and email from the Editor/Publisher of Destinations Travel Magazine, that the April 2011 has been released, and my Photo Essay “The Covered Bridges of Chester County” has been included as the first of a planned three-part series of Photo essays! 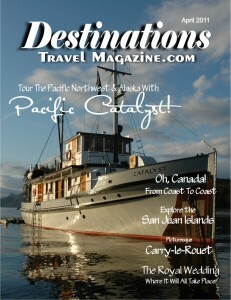 Each photo essay is geared to be single 8 hour day trip. Hope you enjoy them, and I would love to hear your feedback! 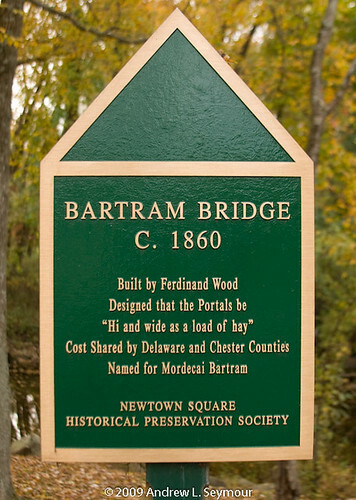 Built in 1860, Bartram Covered Bridge is located just off of Goshen Road about 2½ miles West of Route 252 in Newtown Square, Chester County PA. It is not recommended to park on the side of Goshen Road itself, because many people drive to fast in this section of the road, but there is some road side parking available on Boot Road. I had been driving past this bridge for years and never stopped to doing anything about it, until today. The beautiful late “Indian Summer” weather, combined with the cold nights have cause a very vibrant and colorful Fall foliage surrounding the bridge. The bridge crosses over Crum Creek, and there is a small area for kids to run around, or a blanket picnic, as well as a few benches and rocks to sit on. When you approach the bridge from the park area, you will notice the free-standing main bridge information plaque. 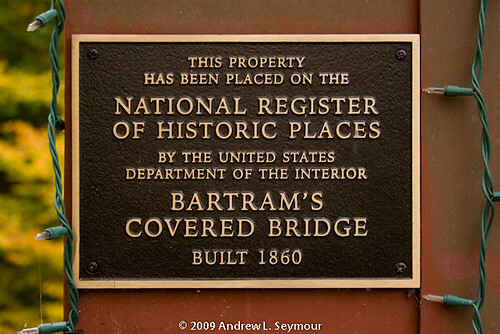 As you get closer to the bridge, the next sign that you will see attached to the bridge, is National Register of Historic Places plaque. One can not walk into the middle of the bridge, because there are metal security bars covering both entrance ways from top to bottom, but as you look more closely through the bars, you can see some holiday string lights attached to the long side walls. This picture was taken on the opposite side of Crum Creek from where you can park, and to reach it, you have to walk around the bridge, and into the woods, then down by the water. All images were taken with a Canon XTi on a Bogen (Model 3020) tripod with a Canon Remote Switch RS-60E3, using the native 16-bit Camera Raw (cr2) format. The ISO Speed was set to 100. Images were then transferred to a Microsoft Windows XP (SP-3) based computer and converted into Adobe DNG format, with additional processing done with Adobe Lightroom and Photoshop.